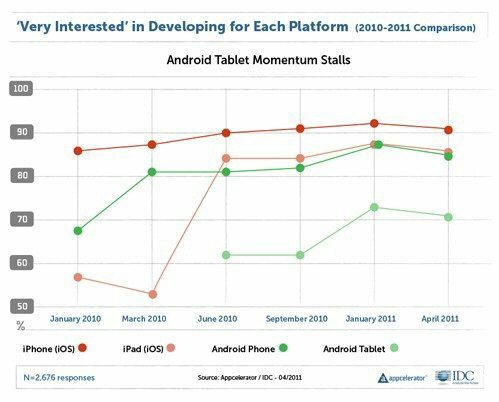 Apparently developers are finding it somewhat difficult to keep up development of apps for the iPhone, Apple iPad, and the Android platform according to a recent survey of 2760 mobile developers which apparently shows that over the last 6 months developer interest in both iOS and Android had remained flat. According to Technology Review, a joint survey by IDC and Appcelerator, developers say the problem with Android is that the platform is deployed on numerous devices it is apparently becoming increasingly difficult to develop for it. Apparently the survey showed that besides the Android and iOS platform “treading water” the BlackBerry platform might well be heading for “serious trouble.” Apparently developer interest in BlackBerry fell 11 points since the last quarter while just 27% of developers said they are “very interested” in developing for BlackBerry. Developer momentum is shifting from native development to HTML5 Applications! According to Appcelerator’s report ALL native development platforms are loosing interest among the asked developers (except curiously WebOS). That is the interesting part. Appcelerator ignores this – why? Maybe because Appcelerator has chosen a strategy of generating native apps! The Appcelerator report does not mention HTML5 with even a single word. It is a clear breach in the surveys quality that it ignores HTML5. Now we can only guess – but it seems pretty obvious to me: Developers are starting to (considering to) leave native development in favour of HTML5 (and cleverly so, I think). iOS developers moving a little slower on this than Android developers. This, in my mind, is the only fair interpretatin of the survey results. Very nice this shows fighting between these mobile companies will definitely decrease the price of these great mobiles indirectly people will be happy at the same time which company reduce the price and with best features of mobiles they will be in the first place obviously so we shall see who will be in the first place.